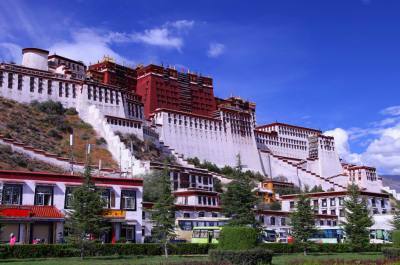 The tours start from Lhasa, capital and historical city of Tibet. If you are taking flight from Kathmandu, it is with spectacular mountain views and scenic Tibetan landscape. Another option to reach at Lhasa is from mainland China. Spending 3 nights in Lhasa (3,650miters) is enough time to acclimatize at high altitude. At the time of staying in Lhasa we explore famous Potala palace, Jokhang temple, Norbulinka palace, Drepung monastery and Barkhor Street. Our journey then drives to Shigatse, Lhaste and reach at Everest Base camp via Ronbuk monastery. Enjoy breathtaking views of Himalayas, beautiful lakes and scenic landscape. Meet cultural peoples of Tibet and explore their settlement. Saga is the first town we enter at Kailash or Nagri region after Everest Base Camp. We than drive towards holy Lake Manasaroar and Mount Kailash. Stay one overnight at bank of Lake Manasarovar and explore around. 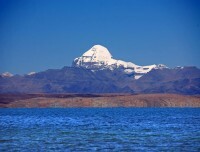 Mount Kailash south face is clearly visible from Lake and surrounding area. Take a holy bath before we heads to Darchen town which is base of Mount Kailash is preparation place of Kailash circuit/ Kailash Parikrama. 3 days Kailash parikrama is trekking about 39 kilometers by crossing Dolma La (5,600m) pass. Afterward drive back same way to Lhasa. 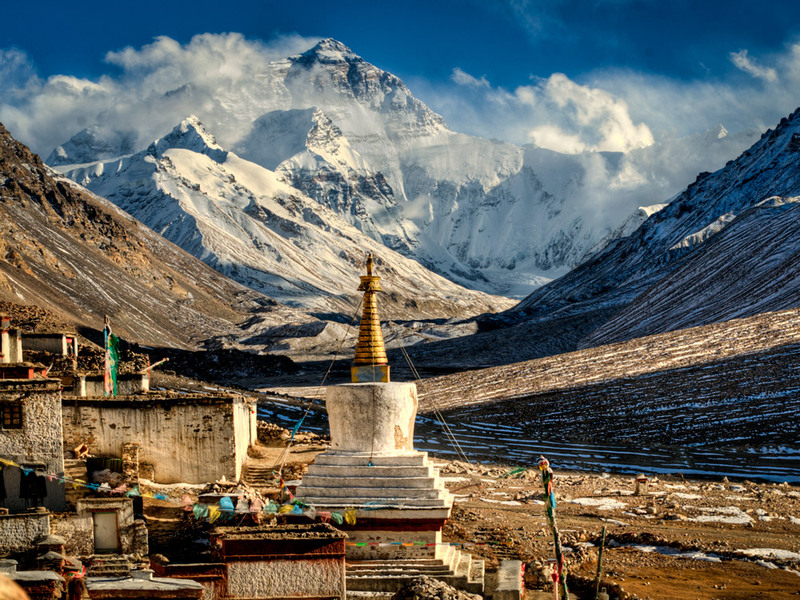 Lhasa Kailash Everest Base Camp Tour can start from Kathmandu Nepal. It has option to take flight to Lhasa or drive via Kodari boarder to Everest Base Camp first and reach at Kailash and Lhasa at the end. You can end your tour either in Lhasa or in Kathmandu. 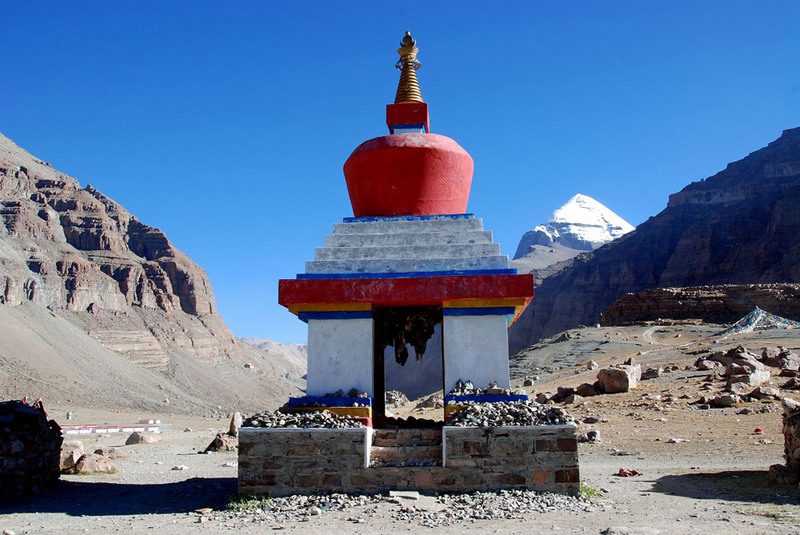 Tibet Kailash Travel can provide you perfect tour plan (vise versa) as per your interest. 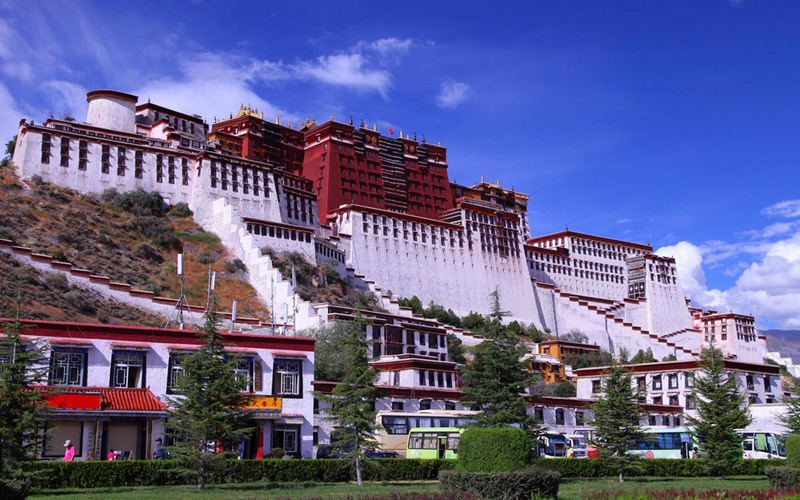 Guide from Tibet Kailash Travel will lead you sightseeing in historical places around Lhasa. 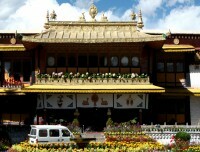 Jokhang temple, the house of Lord Buddha was found in 647 Ad by King Songtsen Gampo. Founded in 1419 Ad Sera monastery is the university for monks. Another visit today, Drepung Monastery is also a university of over 7700 monks. After your breakfast in hotel start sightseeing in Lhasa. Potala palace in Lhasa is house of Dalai Lama until 1959. It is listed in world’s heritage sites and one of the wonder of the world. 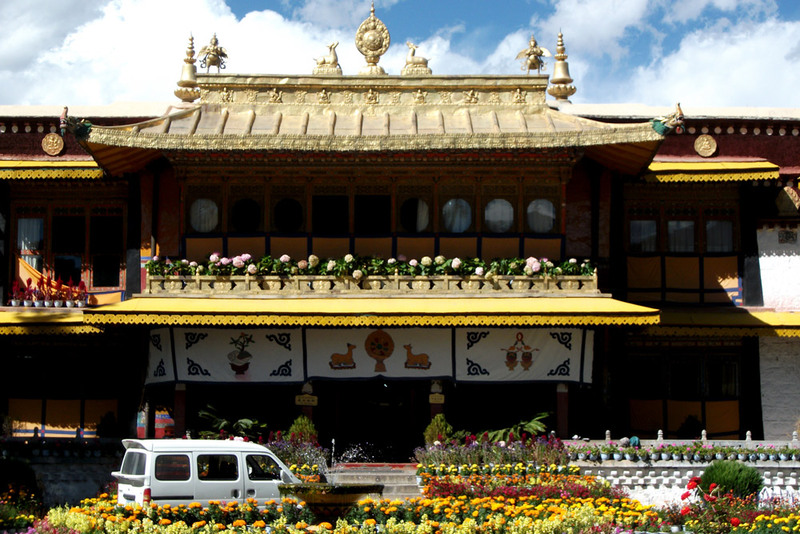 Another attraction Norbulinka palace is traditional summer palace of Dalai Lama built from 1755. Visit Barkhor squire which is old market of Lhasa. Drive start after your breakfast in Lhasa. You can view golden field on the bank of Lhasa River. Passing several high passes get clear view of Tibetan Himalayas and giant glacier called Khorala glacier 7200 meters high. Reach Shigatse, second largest city in Tibet and administrative center of west Tibet. Mount Everest is just 5 hours driving from here. 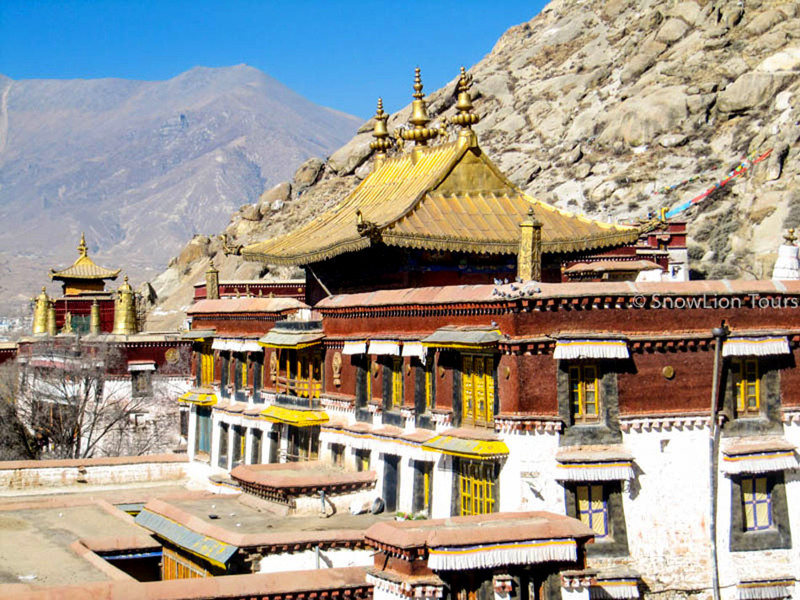 After breakfast, visit TashiLhumpo monastery, the seat of Panchen Lama and drive to Tingri visiting Sakya monastery. One of the very famous monasteries in Tibet, and we also cross the highest pass called Gyatso La (5200m) on the way driving to Tingri, the entrance of Himalayan Nature Reserve. It is short drive to Rongbuk monastery through new winding road in the mountains. Enjoy the stunning mountain scenery; past the wild grassland, the torrent and soaring mountains. You can see the panorama of Himalaya range including the 4 8000m high mountains and more to enjoy like Mt. Lhotse (8516m), Mt. Everest (8848m), Mt. Qowowuyag (8201m) and Mt Makalu (8463m), and even majestic view of golden summit of Mt. Everest at sunset. Enjoy the sunrise view on the top of Mount Everest from Ronbuk Monastery. We than further drive to Saga. Saga is the first town in Nagri kailash region. It is also call entrance gate of Lake Manasarovar and Mount Kailash. Journey start with full of excitement to see first view of Mount Kailash and lake Mansarovar. Reach at small town Chiu Gumba for overnight. You also can visit Chiu monastery at top hill near bank of Mansarovar. Enjoy evening and night with good view of Mount Kailash. 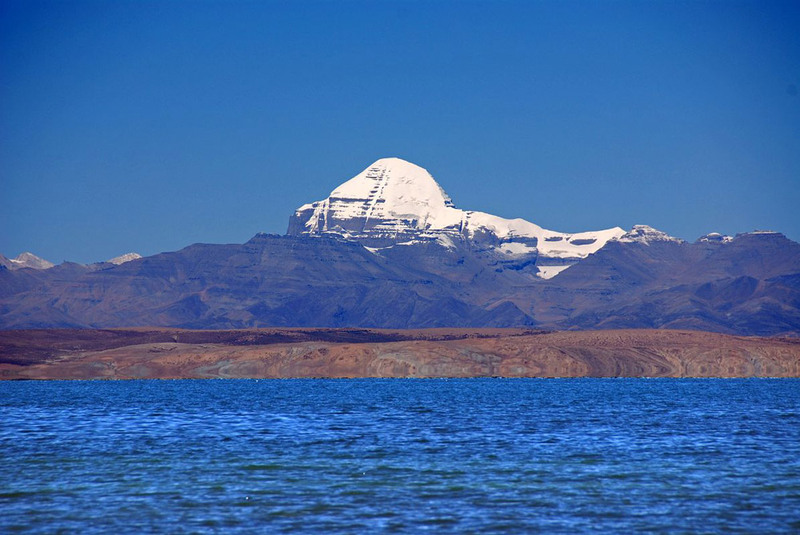 You will have enough time to explore Lake Manasarovar and surroundings. It is only short drive to Darchen and we will do it only after Lunch time. Darchen is the base camp of Mount Kailash from where we start our Kailash Parikrama/ Kailash circuit. preparation of parikrama and stay overnight. Early in the morning, start driving to Valley of the God. If you have chosen your personal horse and helper, you will meet here. It is about 18 kilometers easy walking toward Derapuk. North Face of Kailash. Our Kitchen team provide you light and warm dinner. Overnight at guest house. Second day of Kailash Parikrama is a tough day of the Yatra. Start early in the morning. tough uphill till Dolma La pass and immediately serious downhill till basic tea house at bottom of hill. then easy walking to Juthulpuk. It is trekking route entirely and takes about 9 hours in total. Simple dinner provided by our team in Juthulpuk. 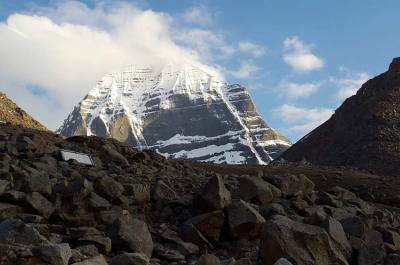 Third day of Kailash parikrama is final day of Parikrama. It is easy walking about 3 hours till Darchen and drive back to Saga via same way. You also can fill holy water at Lake Manasarovar. It is same way drive back to Shigatse from Saga. All the Nepali staff team will leave you from here. You will have enough time to visit Shigatse city at late afternoon time. You dinner will be at a restaurant. Driving same way back to Lhasa. It is long driving at the end of the tour. transfer to hotel and final pack to get your early flight tomorrow to Kathmandu. Representative from Tibet Kailash travel arrange departure to train station or to Gonggar Airport. Accommodation in Lhasa Kailash Everest Base Camp Tour is in Hotels and guest Houses. Hotel in Lhasa, Shigatse is based on twin sharing 3 star category hotel. Guest house in entire Kailash and Everest Base Camp is in group sharing/ Twin sharing room in standard category. You do not need to sleep at tent the or at camp. We provide you best available guest houses in the region. You still have an option to make upgrading of Guest house in Darchen, Lhasa and Shigatse to super deluxe which is possible with your own extra cost. Transportation in Lhasa Kailash EBC tour is with private and comfirtable bus/ van. It is depend on group size. Our package including every morning breakfast. Lunch and Dinner is extra cost. There are choises of international restaurants in Lhasa and in Shigatse. Only simple Chinese and Tibetan style restaurant are available in Kailash region and EBC. Drinking water in the entire tour is with extra cost. You can buy bottled miniral water. Is is good idea to buy enough water in Lhasa and put in your bus. It is advice to drink at least 3 littlers water perday. Get clean toilet inside of your rooms in Lhasa, Shigatse and Saga. Toilet at rest of the region are very basic. It is outside of the room as a common use. Toilets are dirty due to lack of enough water. Peoples are using outside toilets freely in Mansarovar, Derapuk and in Juthulpuk. 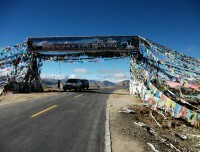 The entire trip is handled by a professional Tibetan guide and drivers. We also can provide you full staff team if we need to serve hot dinner and Lunch from our own kitchen. We do not need trip insurance for official Kailash permit and visa. Travel insurance may need to cover your own expenses in the case of any emergency evacuation. It may more helpful in case of returning from middle way due to the health problem. Or may cover your expenses in the case of emergency evacuation. Due to the health problem or any other problem, if anyone needs emergency evacuation that cost is the extra cost and all the expenses go to the person. We arrange all the needful services. Helicopter rescue in Tibet part is not allowed. Rescue have to done by driving in Tibet/Kailash part. Once you reach at Nepal site, Helicopter rescue is also possible. Kailash is the lack of Hospital and medical facilities. Only one hospital service is in Taklakot. Rest of other villages and towns are without any medical stores and Hospital. In the case of emergency, have to drive Taklakot for a hospital. The team from Tibet Kailash Travel bring basic medicines in the entire tour. Our leader and guides have basic first-aid knowledge. 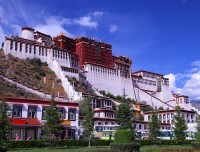 Main cities of centreal Tibet like Lhasa have good facilities of hospital and medicament. 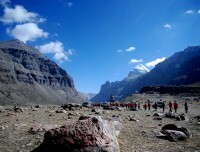 Kailash EBC Tour from Lhasa can be private tour from 1 peoples. If you want to join our group in fixed depature date, is the option. There is no any age limitation for Lhasa Kailash Tour. For Indian passport holder, there is age limitation. There are local telephones facilities in entire Kailash, Tibet and Nepal. For your , mobile you need Nepali SIM card in Nepal site and Chinese SIM card once you enter Tibet. Chinese and Nepali sim card can buy after certain formalities and can recharge on the way. WIFI is available in Nepal part, central Tibet but not in Kailash region. You can connect internet facility with Chinese sim card. Mobile network doesn’t work only one day at Kailash Parikrama. Physical fitness is important factor to make your trip success. But we do not need any doctor or medical certificate to obtain your Kailash Tibet permit and Visa. It is adviced that prepare your trip before 3 months of starting by doing some physical activities like jugging every morning. Acclimatization in this tour is important and need before reaching at high altitude immediately or so fast. Kailash and EBC region is in high altitude which may make difficult for every visitor. 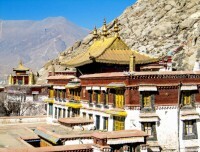 Our itinerary is including enough acclimatization days in Lhasa (3700miter). There can be possibilities of some extra activities during Kailash Yatra and Tibet Tour. Visit Chui Monastery and hot spring near Lake Manasarovar. Put one more day in the itinerary and reach at Charansparsa from North face of Kailash. Drive to Tirthapuri with extra cost. 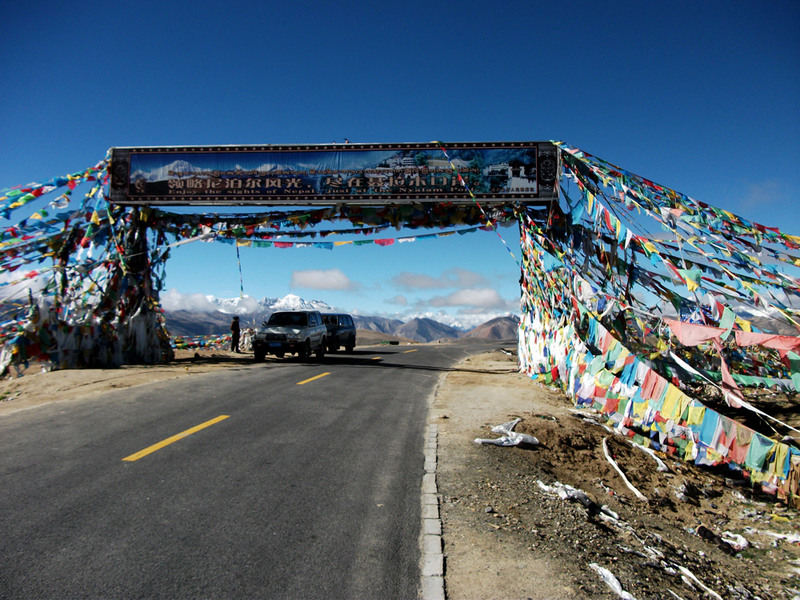 Drive to Namtso Lake from Lhasa with extra cost. Kailash Yatra during full moon is not recommended. Most of the pilgrimages want to reach at Manasarovar or in north face of Kailash during full moon because of that overflow of peoples reach region. It can be lack a f accommodation and transportation. There are many bad experiences that Tibet government stops entering some group during the period. By this reason, peoples may get suffer. Full moon does not affect any in Lhasa part. 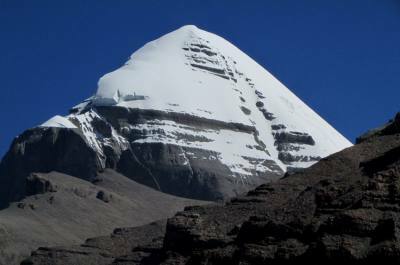 Best season for Lhasa EBC Kailash Tour is from April till September month. Small group departure can be at November month too. rest of other months are more cold and icy on the way. You need one big bag to put your stuff that goes to back or upper part of the bus. Another small bag pack is always with you to put important things like money, water bottles etc. You need comfortable warm shoes for entire yatra. Another spare shoe or sandal is needed to wear while staying at guest house. 3 pairs of warm shocks are enough for entire trip. You can wash it in middle of your Yatra. Head cover hat, Mouth covering muff, Warm down jacket, Wind proof jacket, Warm inner thermal, 2 pairs light T shirt, Warm sweeter or light weight jacket, Inner down thermal, Water and wind proof trouser, One or two long wear trekking paint, Whole body covered raincoat, Water/ wind proof warm glove, 3 pair comfortable underwear, Down sleeping bag. UV protective sun glass, Medium size quick dry towel, Head torch light with extra batteries, Lip care, Sun cream, Trekking stick, 2 litters’ water bottle, One small thermos water bottle. First Aid kit box containing Paracetamol, bandage, antiseptic cream, Diamox or other tablet for altitude sickness, Small trekking knife, Some dry foods, Camera and its extra batteries, Mobile, and charger with small multi pins. - Trip confirmation amount USD 300 per person. You can ask our bank details to deposit it. -This tour can be private of group Joining tour. At a time of your booking confirmation, please get our term and condition. © 2019, Tibet Kailask Travels & Tours Pvt. Ltd. All Right Reserved.